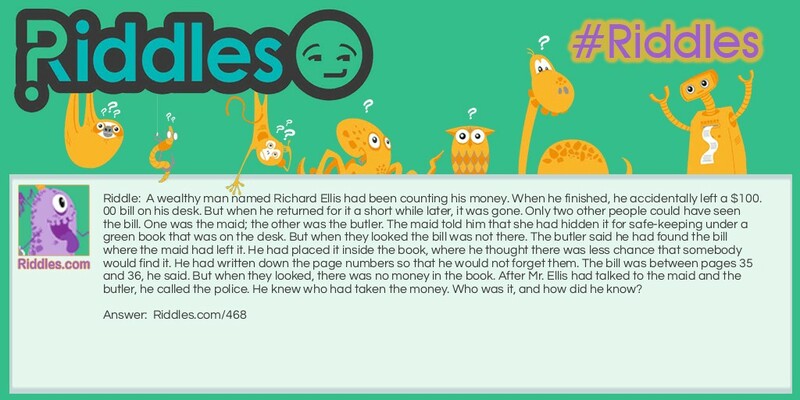 A wealthy man named Richard Ellis had been counting his money. When he finished, he accidentally left a $100.00 bill on his desk. But when he returned for it a short while later, it was gone. Only two other people could have seen the bill. One was the maid; the other was the butler. The maid told him that she had hidden it for safe-keeping under a green book that was on the desk. But when they looked the bill was not there. The butler said he had found the bill where the maid had left it. He had placed it inside the book, where he thought there was less chance that somebody would find it. He had written down the page numbers so that he would not forget them. The bill was between pages 35 and 36, he said. But when they looked, there was no money in the book. After Mr. Ellis had talked to the maid and the butler, he called the police. He knew who had taken the money. Who was it, and how did he know? The butler did it. Mr. Ellis knew the butler was lying because pages 35 and 36 in a book are always printed on opposite sides of the same piece of paper. Money Talks Riddle Meme with riddle and answer page link.